Sumatran Storm is the kind of game that will impress you and make you want to try it out from the first moment you lay eyes on it. It has a very different type of setup, with 3 to 5 symbols used on the reels, plus high quality graphics and generous features. Designed by IGT, the game has a nature inspired theme, showing you the wildlife of the island of Sumatra, which is part of Indonesia. It’s an unusual layout, with 5 reels and 720 ways to win on them. 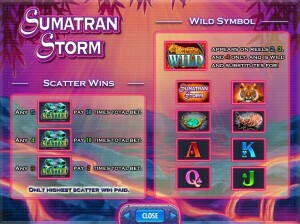 The symbols will give you access to free games, scatter symbols, wilds and the Multiway Xtra system. With a big enough wager on the line, you can expect top payouts of $50,000. 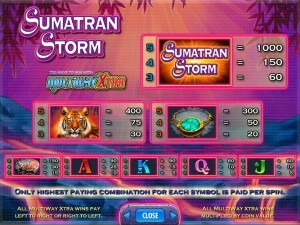 One of the biggest features of Sumatran Storm is the Multiway Xtra system and the use of ways to win. 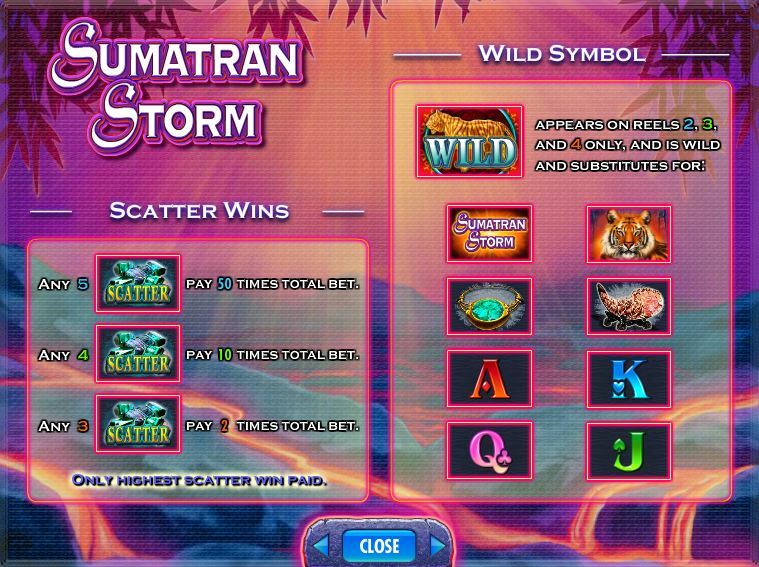 You can add to the list of cool features the scatter symbols, the wilds and the free spins. The game’s ways to win are enhanced by the Multiway Xtra feature. You not only get combinations formed by symbols which are just on neighboring reels, you also get them to form from right to left as well, not just left to right. You have a total of 720 ways to win in this game. The wild symbol shows you the profile of a tiger. Its presence is allowed on three reels, the ones from the middle. The substitution occurs only for the regular symbols, which are trying to form a combination. There are no direct prizes being offered by this symbol. Second, we have the scatter symbol, which offers you prizes by taking into account the wagers that you placed and the total number of icons of this type that are present. As scatters, these symbols can be anywhere on the reels, as long as the minimum number is met. Pays vary between 2x and 50x the total bet. 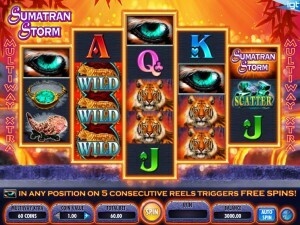 The Eye of the Tiger scatter is the one to trigger the free spins, but it feels a bit stingy. 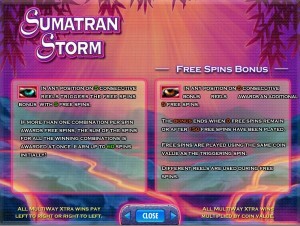 You need five of these symbols on five reels, and in exchange you are rewarded with only 5 free spins. You can get up to 60 spins at once though, since multiple combinations can be formed during the same spin. You can retrigger this feature, but the requirements are the same. In order to cover the 720 ways to win used each round, you need to use 60 coins. You can’t use fewer coins, or more for that matter. You can just change the coin value as needed, within the $1 to $50 range. You can expect the maximum bet to be worth $3,000. Since the slot offers a 1,000x jackpot, you can take home up to $50,000 from regular combinations formed on the ways to win. Scatters will pay you up to 50 times the total bet, so you also have a chance at a $150,000 top prize. Sumatran Storm’s design is quite enjoyable, with a volcano’s effects being visible in the background, where rivers of lava are flowing. The reels are in front, and they’re special as well. The 1st and the 5th reels have three symbols on them, the 2nd and the 4th have four, while the 3rd reel comes with five symbols. The playing cards are the only ones that feel out of place, lacking any kind of theme. 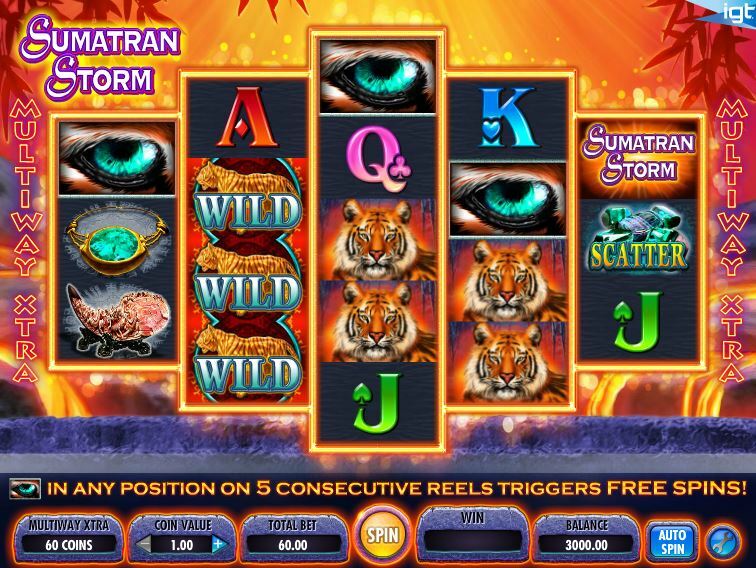 Symbols: Wild Tiger (wild), Scatter (50x the total bet, scatter), Eye of Tiger (scatter), Sumatran Storm (1,000x), Tiger (400x), Eye of Tiger Necklace (300x), Fire (150x), Ace (90x), King (90x), Queen (60x) and Jack (60x). It’s an unusual game, but also a very pleasant one. It has things you rarely see in other slots, but you need to afford using a wager of at least $60 each round, so it’s not cheap. 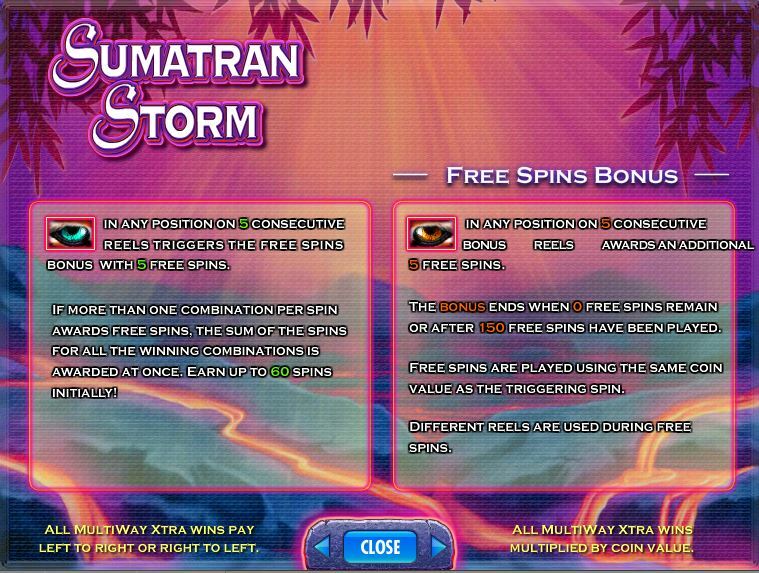 This Sumatran Storm slot is offered by all online casinos with IGT software, playable either in practice or in real money mode.